This was the first phase of several projects by Burrell at Duddingston House. Undertaken with Balfour Beatty, the development created a comtemporary interpretation of a traditional courtyard in the lea of Duddingston House. 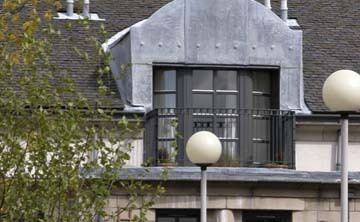 Designed by Glasgow-based Simister Monoghan, the project provided a mix of housing and apartments. Post Modernism is again to teh fore, as it was in much of the work of the period, albeit in a restrained form, and costructed in stone, slate and lead. This was an expensive design. The ssecond phase, located well to the south of the House, was never constructed as the recession took hold. The site was eventually taken up by Miller Homes who built their own variation on the design.